Dates: Folmer Hansen 1930–2014 ; David Ross 1925-1974. Production Dates: 1961 – 2005. Kiln: originally electric for earthenware; from 1962 a high fire stoneware kiln; cone 6-9. Types of Ware: Primarily wheel thrown functional ware’,earthenware and stoneware. Some architectural mural involvement. The studio of the Dane, Folmer Hansen, and the Winnipegger, David Ross, in the Qu’Appelle Valley, Saskatchewan illustrates both the importance of the Saskatchewan government’s emerging support for the crafts in the 1950s, and also the importance of Saskatchewan as a regional driver in the history of ceramics in Canada. Impetus for the set up of the studio started with Nora McCullough who had an interest in Scandinavian design so popular at the time.2 Her initial connection was with David Ross. David Ross: The pre-studio years started with the teaching activities of David Ross for the Saskatchewan Arts Board. Ross had connected with Folmer Hansen during a Scandinavian study tour in Denmark in 1954. David studied ceramics at the University of Manitoba’s School of Art from 1950-54 under Cecil Richards, in the advanced education program with the Fine Arts Program at the University of Manitoba. He graduated with a Masters degree in 1954. After graduation he went to study in schools and studios in Scandinavia and England. It was during a brief stay in Denmark that he first met Folmer Hansen at the Copenhagen Clayworks. The partnership connection was not immediately fruitful and they would not reconnect until 1958. 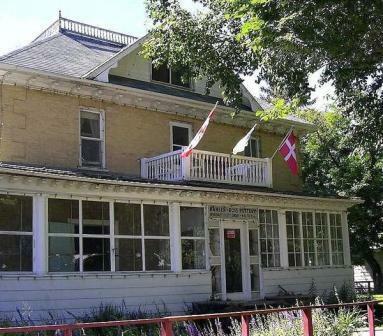 Norah McCullough, Executive Secretary of the Saskatchewan Arts Board, herself an admirer of Scandinavian design, recruited Ross to work and teach in the new workshop, Craft House, a converted rectory, set up in Fort Qu’Appelle. Ross worked out of Craft House in Fort Qu’Appelle from 1956 until the Hansen Ross studio was set up in 1961. Part of the mandate for working there was extensive travelling and educating through lectures and workshops in many small communities throughout the province. This approach expanded high quality ceramics training throughout the province, outside of the realm of higher educational institutions used in other regions. Folmer immigrated to Canada in 1957, initially planning to stay only a year or two. While in Halifax he heard about the Deichmanns. He joined their workshop in Sussex throwing pots during the period 1957-58. Artistically he felt Kjeld Deichmann was self-taught, that he threw simple forms and that their work was “quite nice but not exceptional, with nice glazes.”1 With the many visitors there was enough business to pay him a wage but he was hidden out of sight when they came.1 While in the Maritimes he travelled and also met the Lorenzens. His work with the Deichmanns does raise a possible question of just what was – or is – a Deichmann thrown-pot from the period 1957-58; however, this is a complicated question, since it is hard to exactly date the Deichmann ware of the period. 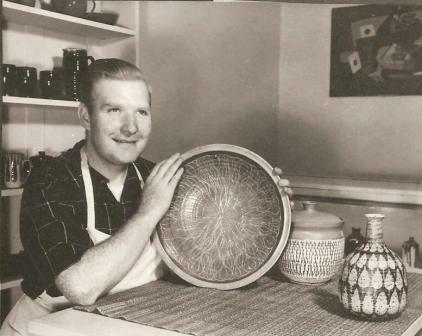 The Hansen-Ross Pottery: In 1961 a year after the Saskatchewan Arts Board sold Craft House they bought the facility and started their studio. The site was an old converted rectory. Teaching and production were studio mainstays with much of the latter supported by tourism. Eventually they had to cut back on the teaching to focus on their studio production. They soon developed a 50/50 partnership, that Julia Krueger calls “hybrid.”5 They appreciated much the same kind of work because of their Scandinavian experience. Folmer did most of the throwing because of his apprenticeship experience, while David did most of the glazing, decoration and firing. Almost everything was thrown with little building.1 Although he had an electric wheel Folmer preferred the kick wheel.1 Although their setup was not in the strict Leach tradition of potter-artists, the arrangement produced benefits in that Hansen could take the time to throw refined forms while Ross could explore sometimes complex, intricate designs and glazes on even small forms. The quality of their work caught the attention of international and national collectors, resulting in their being included in the 1967 Expo exhibition Canadian Fine Craft among others. 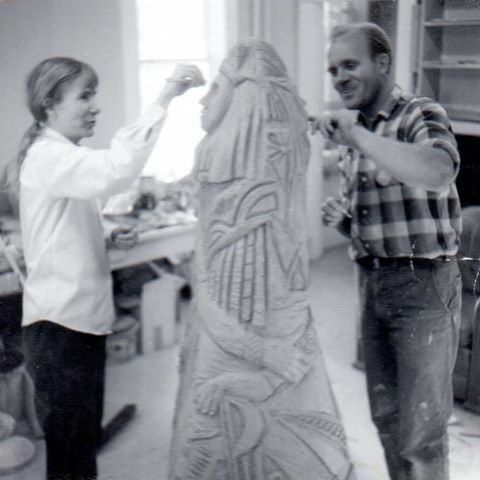 Their production consisted of majolica, underglaze painting, sgraffito, wax resist, carving and slip trailing.3 Lesser known is the collaboration on a larger scale with artists such as the religious ceramic muralist, Lorraine Malach. Word-of-mouth was the best advertising. Although on the tourist route they considered themselves studio potters, only delving into mass production when making items such as coffee mugs.1 Folmer stated that 90% of their sales were in the summer tourist market with people traveling around Saskatchewan. 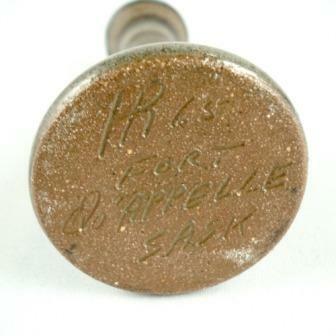 Although peoples’ taste did improve over the years most buyers wanted something small they could take home with them. They were mentioned in most travel brochures.1 Their “tourism” status paralleled the earlier experience of the Deichmanns in New Brunswick in the 1940s and 1950s. Provincial governments of the time were much aware of the economic potential of craft activities. 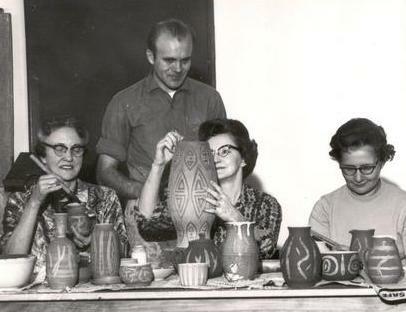 After the tragedy of David Ross’ death in 1974 Folmer continued production, mostly in high-fired functional stoneware – vases, jugs, teapots – often with less decoration, mostly sgraffito. The elegant forms were still there. To sustain production Hansen hired apprentices over the years but keeping up with the demand was a strain. Eventually he closed the studio in 2005. The works from the Hansen-Ross pottery stand out for their faithfulness to the modernistic Scandinavian design tradition. They were partially influenced by the Leach-Hamada craft ethos, dominant since the 1940 publication of Leach’s “A Potters Book.” They were, however, relatively uninfluenced by the new tidal wave of American-inspired styles, forms and teaching. A joint similarity of training and aesthetics kept the Hansen-Ross line pure, clean, precise and modern in the Scandinavian idiom. Their works possess a geometric simplicity of form whether ovoid, cylinder or circle: vase or bottle, cup or dish. The surface decoration can be linear and deeply carved, or etched sgraffito, or linear, slip-trailed flows and bands. It is always precise and pure with no fussiness. The colours are usually muted, sometimes flat when from the electric-kiln firing, sometimes speckled like a bird’s egg when from the gas-kiln firing. Folmer acknowledged they usually avoided high gloss glazes.1 Later works, post-1974, can be loosely identified by the relative sparseness of surface design. The overall designs always enhance and define the forms. Their work can be seen by some as problematic. There was definitely the tourist trade in such things as the thousands of coffee mugs purchased. Yet there was that other side to their work, the work of the potter-artist, with unique, sometimes large one-of-a-kind pieces that appealed to collectors. An interesting side note is the earlier impact of Scandinavian art and design on other Canadian artists, specifically, on the formative years and works of those who would become the Group of Seven. 1. Barry Morrison. Interview with Folmer Hansen November 23, 1981. 2. Alfoldy, Sandra. Crafting Identity. McGill-Queen’s University Press. July 26 2005. 3. Hansen-Ross Pottery Brochure: An Introduction to Saskatchewan’s Unique Pottery Studio. 4. Artist’s death ends 20-year relationship: Fort Qu’Appelle craftsman continues work. The Leader Post Regina, August 29, 1974, p.6. 5. Krueger, Julia. 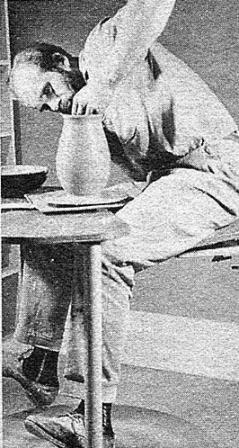 Hansen-Ross Pottery. Tourist Ware or Something Else. Cahiers Metiers d’Art – Craft Journal, v.5. No. 2, Spring 2012. pp. 48-62. Thank you for this historical piece. Very interesting. I now own the Historic Hansen Ross House and have sent up an Artist in Residence program here so that the history of Folmer and David can live on. Congratulations on acquiring the Hansen-Ross House, and starting the artist in residence programme. It’s good to see continuity. Please let me know more of your plans and activities. Hansen and Ross are two of my most read artists. Please keep in contact and let me he site readers know how your plans develop. Yes I will keep in contact. We are up and running now and have completed massive renovations. The historic kiln is still there, along with original wheels, electric kilns etc. Just looking for potters now to move in and work away!